Crusade 2019 Competitions are again being hosted by PDWS at our annual show. We have 2 competitions on offer. The normal format is a qualification period using ‘world cup’ format. That is the players are split up into four groups. The groups then complete an all-play-all sequence. The four winners proceed to semi-finals and thence to the grand final and third/fourth play-off. Anyone not qualifying for the finals may enter the plate competition, which is more strictly timed and aims at a three round Swiss tournament. Rules will be DBA version 3. The tournament is totally open in that any legal army may be fielded and anyone may participate, even if they aren’t Welsh. aldavion@yahoo.co.uk Hope to see you there! 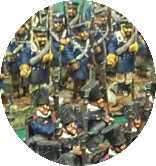 We are delighted that once again Mr Trevor Halsall has offered to run a 15mm Napoleonic Compitition again for us. Players may use their own troops but a wide selection of 15mm armies are provided by the Organizers so you don’t need anything other than dice and a tape measure to participate, just turn up (terrain provided). Armies for each round are selected from those available randomly, so you get to use different armies. The Competition is designed to be fun rather than intensely competitive, and participants not familiar with the rules are welcome (just basic knowledge of Napoleonic tactics needed) – an enjoyable introduction to the rules and masterclass.